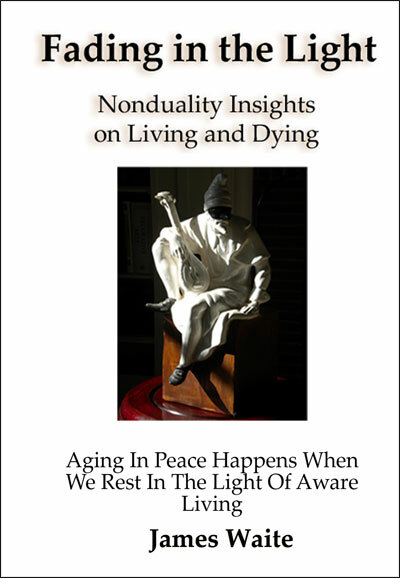 FADING IN THE LIGHT introduces a rarely presented sense of the Timeless in its revolutionary approach to aware living and aging from a nondual perspective. This timelessness is not religious or philosophical or even, ultimately, spiritual; it’s the practical reality of our need as we all age to understand time from the perspective of the timeless. To explore the face of reality we all see in our mirrors day to day, but with new eyes to see the underlying truth of our Being. It is engaging and transformative, shining a new light on what we think we know about who we are, what life is and what death is. Perhaps now, in these more open and informed times, it has a role to play in addressing why and how we suffer unnecessarily from our own religious and culturally institutionalized and personalized ideas about life, living, and dying. FADING IN THE LIGHT is now available here.